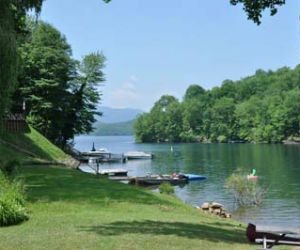 Enjoy the amazing view of the mountains and lake at The Village at Reflection Lake Nantahala. Construction is underway on the first home, and there are now only 11 opportunities left to buy your dream home! Reflection offers customizable cabins in a private gated community with upscale amenities, all priced from $94,900 to $129,900. Plus, the community is a tranquil retreat that is still easily accessible from Charlotte, Greenville and many other metropolitan cities. This summer, until September 30, potential home buyers can enjoy a day at the lake by scheduling a visit. Plus, potential buyers also get a chance to win a weekend at the lake this fall, in a cabin that sleeps up to 14! To schedule a visit, call 866-218-8439 or go to www.lakenantahalareflection.com/thevillage. This entry was posted in Homebuyer Incentives, New Home News, North Carolina and tagged North Carolina real estate, The Village at Reflection Lake Nantahala on August 12, 2011 by Carol Morgan.